Because the event was taking place on an expanse of land where a palace is proposed to be built for the new King, there was that need to set up a big marquee to serve as the hall to host guests who came from far and near. And the interior of the marquee had tables covered in purple and chairs covered in white. There was also a secluded corner within just beside the stage which was reserved for royal guests and manned by bouncers to prevent unauthorized access to the separately covered side. The heir to the creator of Miliki Music, Evang. Ebenezer Obey, Tolu Obey was the artiste on the bandstand who started singing as early as the beginning of the event to usher in people to the celebration. 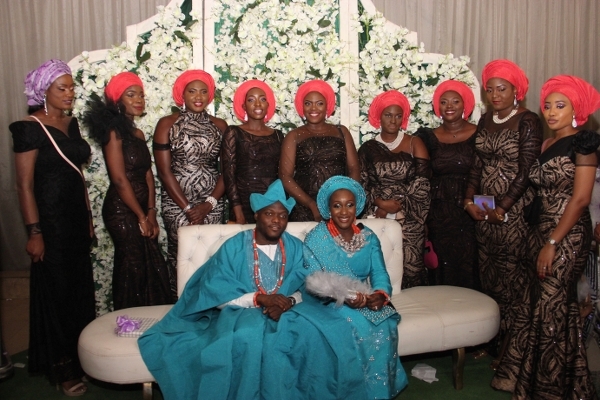 The afro-like grey haired singer was at his musical best as he went into the repertoire of his dad to serve the guests memorable tunes as they took their seats. 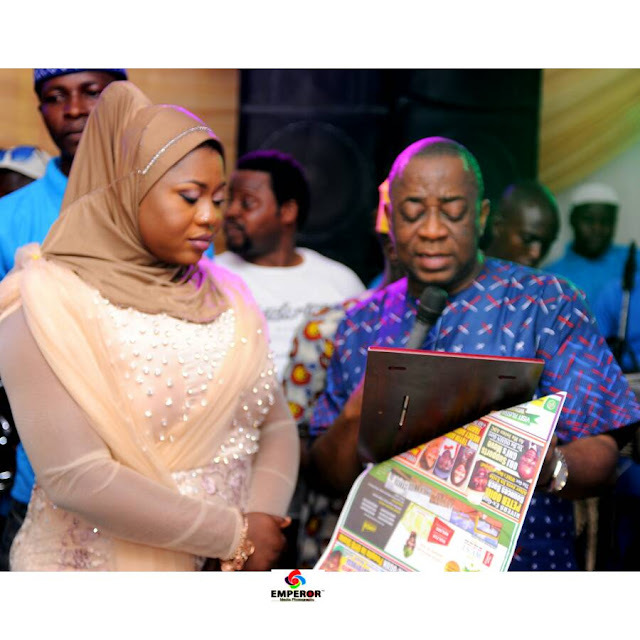 Popular chanter, Alhaji Sulaiman Ayilara who is better known as Ajobiewe was also engaged for the event. And his job was to eulogize some of the very important guests coming in as their names were mentioned by the comperes. As usual, Ajobiewe wowed everyone won with his very deep knowledge of different Yoruba families’ panegyric which he chanted effortlessly and earned him crisp Naira notes in return. For the event to take off officially, host monarch, the Olugbon had to make his entry alongside other Kings from the secluded corner in the hall into the main hall. And the audience gave a standing ovation to the King as made his way to the seat reserved for him very close to the stage. And as soon as he took his seat, the event began officially. Most of the guests at the event were wearing the golden yellow with a touch of purple Ankara aso-ebi chosen for the event. And that brought a good air of uniformity to the gathering which had different interest groups within the community fully represented. Like any event of such magnitude, the National Anthem was recited after the entry of Kabiyesi. And right after that, a representative of the Christian Association of Nigeria (CAN) President of the host Local Government Area, Surulere, was invited to take an opening prayer and that was followed by another round of prayer by an Islamic cleric from the town. Taking his welcome address at the event, the Olugbon thanked God for making the day a reality because man proposes God disposes. He then requested the audience to observe a minute’s silences for his predecessor to the throne, Oba Samuel Adegboyega Osunade. He said he did well for the town during his life time. And he assured the people that the town would not get bad during his own reign too. That the town would experience lots of development as he sang a Christian hymn to further give his appreciation to God for making him the new King. The Kabiyesi who said the event for the day was not his coronation ceremony but rather, a reception for the coronation event which had taken place since July 15th when he was handed his staff of office and other perks, said the venue where the reception was taking place which was 8 hectares of land was the proposed venue of his palace planned to have about 8 different buildings in the next 1 year. And after begging all those who competed the ascension to the throne with his and sought for their cooperation, the monarch made some requests to the state government for his town. Some of the requests were a vocational centre for youths, GRA 1 and 2, commissioning of a Magistrate Court, the State Traditional Council which had not sat for 5 years to resume sitting, revival of General Hospital, building of a stadium for the town, and infrastructures for his newly proposed palace. After the Kabiyesi’s speech, the Surulere Local Government Chairman, Alhaji Ibrahim Gbodeniyi, in his own address, thanked the state governor, Sen. Isiak Ajimobi, on behalf of his people. He said the government had crowned 3 big Kings in his domain which included: Oba Solomon Akinola, the Oloko of Oko, Oba Prof. Akin Akintola Solomon, the Alapa of Apa and the Oba having his coronation reception on the day. After the LGA Chairman’s address, the Oyo State Commissioner for Local Government and Chieftaincy Matters, Mr. Bimbo Kolade, who represented the state governor, Senator Isiak Ajimobi, was invited to the stage for his remarks. The commissioner said the governor actually planned to come personally but an unexpected state matter changed his plans at the last minutes. He then thanked God for the new Oba on behalf of the state governor before reeling out some of the developmental projects that had been carried out by the state government in Orile Igbon. After the speeches ended, it was time to cut the beautiful coronation cake. And the 3 step cake white cake with the one atop designed in the shape of a crown was cut by the Kabiyesi flanked by his Olori and other dignitaries. Immediately after the cake was cut, the dance part of the event began. And the artiste, Tolu Obey who had been singing since returned to the stage to sing some more before handing the microphone to classical Fuji singer, Alhaji Ramoni Akanni, who serenaded the guests with good music till the end of the event. Some of the dignitaries who graced the event included: Oba Olowu, Oba Olugbon, Oba Aresa, Mr. Jare Bamidele, Alhaji Rasheed Ayinla, Chief Olusegun Dokun Odebunmi, Gen. Oladayo Popoola, Mr. Babalola Sheu, Mr. Akinwole Akinwale, Mr. Akin Alade, Hon. Segun Odebunmi and a host of others.